Home > Observations / Reflections > Tech > Is Free Software Really Free – Make Sure You’re Not Surrendering Your Privacy! Suppose you are home alone, minding your own business, and you hear a knock on the door. Answering it, you find a team of people who tell you that they represent one of the largest companies in the world, and they would like to go through your house and find out as much as they can about you so that they can market products and services to you more effectively. Would you be okay with that? OF COURSE NOT! And yet many of you are doing just that every day with your cell phones, your computers, and Facebook. Sometime in the last twenty years or so, you became really important to a whole lot of people – important enough that companies developed intricate strategies just to learn as much as they could about you. It’s not that they think that you as a person are really significant. Your significance lies in the fact that you represent purchasing dollars. You are going to spend a certain amount of money this year on hundreds of products and services. And a whole lot of people are scrambling to make sure that you notice THEM and their products instead of somebody else’s. In fact, there is a battle raging in the technology world right now, and it’s primarily between Microsoft and Google. Amazon is catching up fast as well, and Facebook is nipping at their heels. The battle is for control of information about everybody whom it’s possible to know something about. And you are unwittingly supplying them with the information they want without even being concerned. If they can track what you search for, what you buy, what you wear, what you eat, what you drive, what you do for recreation, what you wish for, etc., then they can quietly insinuate themselves right into your life and have you eating out of their hand. Ever do a search on Google for something, and seconds later it’s being advertised next to your Facebook feed? You know who did that? YOU did. You gave them that open door. They can’t make it any plainer than that. 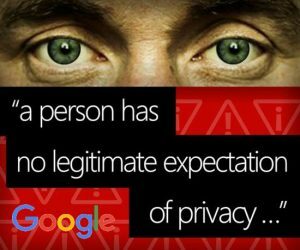 Google says you are giving them the right to go through your “house” and find out everything they can about you. But they’re not the only ones. When you download an app for your cell phone, a notification pops up telling you all the things that the app needs access to. Ever wonder why your flashlight app needs access to your contact list, your photo gallery, and your personal information? When you say, “Okay,” you are willingly giving away ALL your privacy for the ability to see the menu more easily in a dimly lit café or tavern. And you’re fine with that? I won’t use my local television station’s weather app because it wants access to my personal information, my contacts list, and my photo gallery. Why does it need to know who my friends are, or what I took a picture of, in order to tell me what the weather is going to be like? Have you upgraded your computer to Windows 10? At the end of the installation, Microsoft gives you the opportunity to look carefully through their default settings and make whatever changes you like. Most of these are privacy settings. The majority of the public, after upgrading, will choose the BIG button that says something like “Express Setup” (which is like saying Accept Default Settings), and ignore the tiny, almost hidden, link that says, “Customize Settings.” If you choose the Express Setup, Microsoft basically has access to everything you do with your computer and has your permission to use it all to market to you. Literally every keystroke you type will be sent back to Microsoft. If you made that mistake, and accepted the default settings, you can still go back and change them to protect your privacy. You can do so manually, making the changes one by one, or you can download a free tool which allows you the convenience of adjusting the settings all at once in one place. O&O ShutUp10 is one such tool. Everybody LOVES free stuff. And it’s great that you can actually get really good software and apps for free (see the FREE STUFF section on this site). But there’s always a trade-off of some kind. I fully understand that. They’re giving me something in exchange for something of mine that could be of value to them. I’m perfectly willing to give them an email address in exchange for something of value to me. I’m good with that. But I’m not willing to give them total access to all my information, plus information on my friends. Don’t sell your privacy so cheaply! Take the time to make sure you KNOW what you’re giving away. And then make an informed decision. Is it really worth it?